Can we continue to sow seeds of love when we are feeling depleted within ourselves? At times in our life we wonder how we can rise above the challenges that face us. We may feel so emotionally depleted it is difficult to recognise the beauty and wonder of life. For myself it comes down to our willingness to change our mindset. If we are not able to sift our focus within ourselves then the outside world contains endless examples of willingness that can inspire us. This lone flower demonstrates its willingness to survive within concrete. As I observed this tiny flower on my morning walk ,I thought that it must be a struggle to survive in such harsh conditions. Then I realised that although it was surrounded by concrete its roots were being nurtured because they were firmly within the embrace of Mother Earth. So too we are essentially nurtured by Mother Earth, the sun rises each day to give us light and sets to enable us to rest. A wonderful example of willingness took place on a train trip. Our train was stopped by a large tree branch across the track. Buses were to replace the train which meant a much longer trip to Sydney. Lots of passengers mumbled and grumbled about the delays. Accepting the changes I walked onto the platform to wait. Before long I noticed a lady with a small group surrounding her. Curious about what was happening I joined the small group and discovered they were watching the lady paint. Later when I chatted to the lady she explained to me that the reason she and her teenage son were on the train was because he had refused to board the plane they had booked for their trip to Brisbane. Her special needs son disliked crowds so the mother thought a train cabin was the best option. The family was returning to Brisbane where the recent bushfires had destroyed their home. As her son was sleeping the mum ( A portrait artist ) decided to make the most of the delay and paint the portrait of two passengers.The elderly woman in the picture loved it so much she bought the painting. As she did so the elderly lady explained she had just returned from overseas where she had her portrait painted in Paris. Sadly she left that portrait on a train. The elderly lady went on to say that she loved the picture painted by the lady at the station so much more than the portrait she had lost. Not only was I inspired by the willingness of this amazing artist to make the most of the situation, I felt honoured and enriched by the experience. Seeds of love and respect were planted on a railway platform that day as strangers laughed and shared stories. No one noticed the delay rather we all focused on enjoying the moment. The essense of life is to Care. How beautiful is the light that shines on this lovely flower . While the flower alone is quite stunning, the light that shines on it adds another dimension to that beauty as it emphasises the richness and structure of each individual part of the whole. In our own lives we reflect our light to the world, as times that light might seem dim to you , however the richness and depth of that light always remains, even if we do not see it. The beauty of who you are when you open to your true nature ; warms and nurture’s those around you. The gleam in your eye, the brightness of your presence may give strength and hope to another. The love and light you are touches everything around you . The love we are touches all we see. Once we begin to follow our heart’s wisdom, we come to understand that the power of love gives meaning to our life. As we struggle with pain and trauma our world shrinks to accommodate that pain as we withdraw into ourselves. The veils between our heart and soul then begin to shadow the beauty and wonder of everyday life. The magic and mystery is still there as we view our life from the shadows, yet our pain prevents us from feeling the warmth of love’s embrace. When we are able to make peace with what troubles us, those veils begin to lift to once again. At times just a simple thing like a stranger’s smile, an unexpected message or phone call can shift our focus and help us seek a way of feeling better. When we find a space to feel better in our heart opens more and more to the endless ocean of love that is in us and surrounds us. Does the Natural World help you to source your inner joy? Recently a friend of mind had a visit from a Rainbow Lorikeet who did exactly that ~ enabled her to reconnect with her inner joy. My friend rang me and explained excitedly that her heart had been weighed down with concern for the day ahead when a single Lorikeet landed close by and sang to her. As she watch the bight and beautiful bird she felt her spirit lighten. 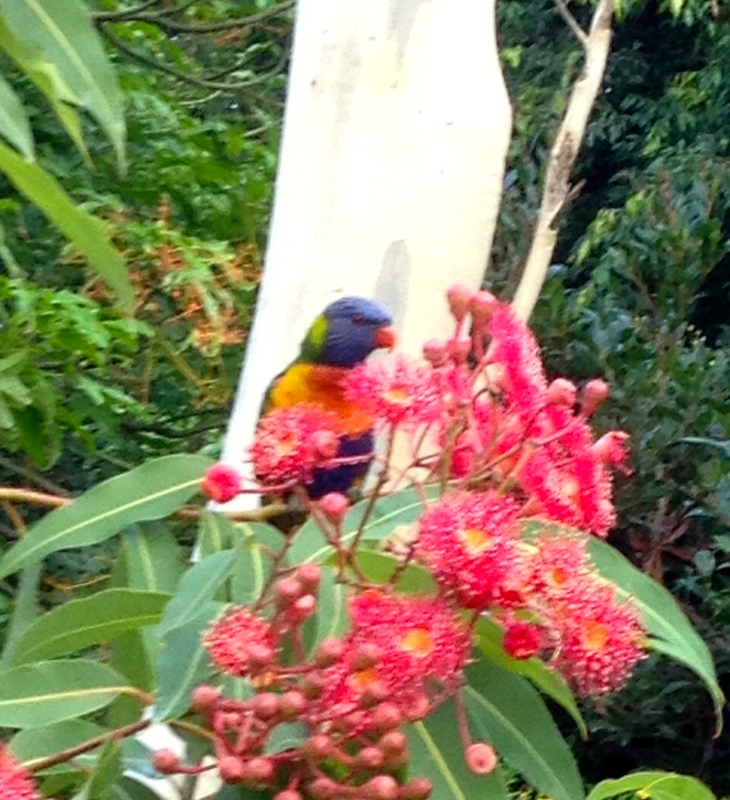 Touched and grateful for the visit of the joyful lorikeet she felt much happier about the day ahead. To read about the spiritual meaning of Rainbow Lorikeet click here. The Rainbow Lorikeet is a lively, social, fun loving bird that bring colour and joy into our lives. These fast moving, nectar loving birds have adapted to change by sourcing food in areas such as backyards where flowering plants and trees provide the food they enjoy. Rainbow Lorikeets nest in hollows in trees, such hollows enable new life to burst forth. At a time in my life when my spirit was broken, it was the creatures of this world, especially birds who filled those empty hollows in my soul. *** Is water a good anology for our Soul? I wondered ***. Does out soul travel it’s own path and then make its way naturally back as part of the conciuosness of all that is. And what of our Spirit? In my personal experience of our life’s journey , our spirit is the spark that ignites the soul into motion ~ to call forth expriences that are uniquely ours for a moment in time. In a way just like the miniatute waterfall, unique unto itself. 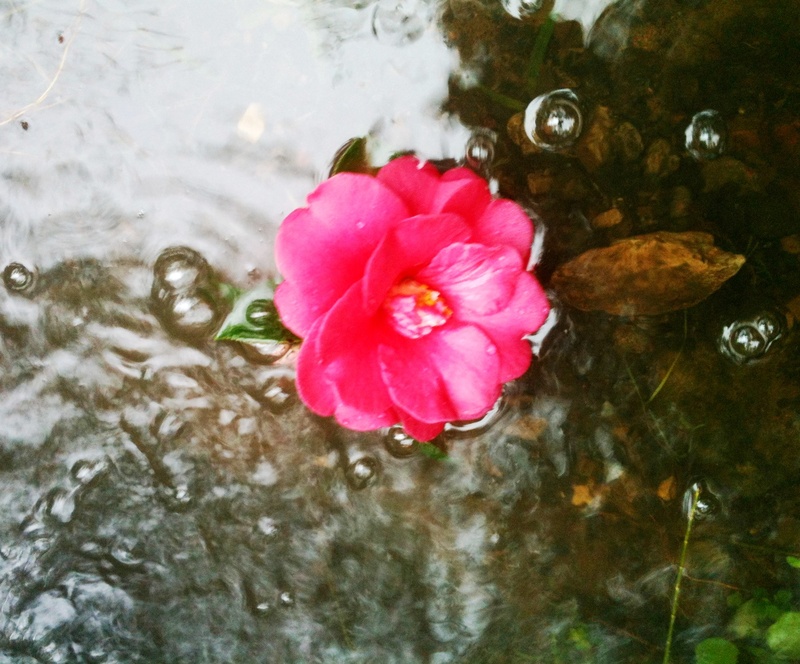 On my return walk I picked up a camellia flower and decided to place the flower in the tiny rock pool. The flower, I decided would represented my spirit, floating gently to and fro on in the waters of my soul. Seperate yet together.